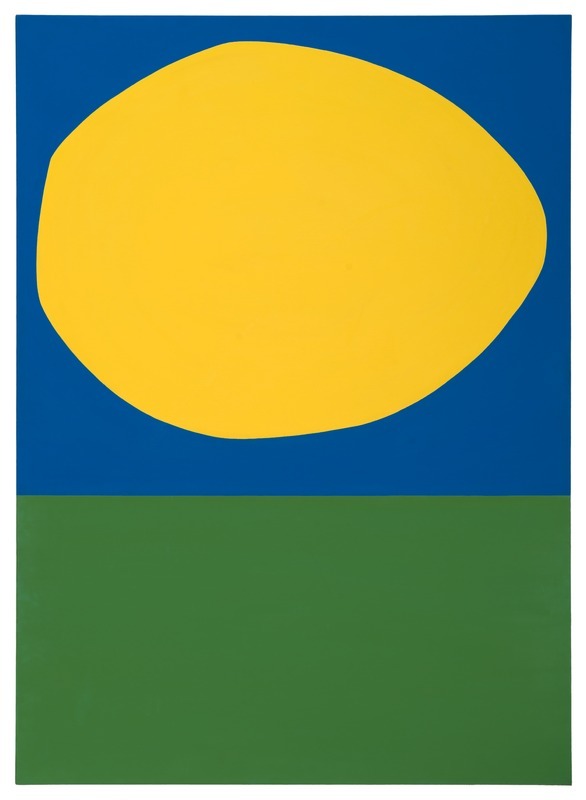 Nature was a primary source of inspiration for Ellsworth Kelly, and it is tempting to read High Yellow as a landscape with green grass, blue sky, and yellow sun. But Kelly believed that art should transcend the quotidian experiences of daily life. Though he derived his compositions from the world around him, he did not intend his work to be seen as representational. As he once said, “The form of my painting is the content.” In order to achieve a purity of form, Kelly took inspiration from the works of anonymous medieval craftsmen and eliminated the trace of his hand from the canvas. By pointing beyond the personal, he felt he could conjure the universal. Kelly is widely known for his intuitive use of color. Yellow, in particular, figures prominently in the artist’s practice—most notably at the beginning and end of his color spectrums. The hue also takes the topmost position in the colored-glass window designs for Austin, Kelly’s most monumental work and the only freestanding building he designed, given to the Blanton in 2015. Ellsworth Kelly, “High Yellow,” Blanton Museum of Art Collections, accessed April 26, 2019, http://utw10658.utweb.utexas.edu/items/show/2729.